This 18k solid white gold diamond ring is sure to leave her speechless and will accompany your special moment to an unforgettable one. Using bezel setting technique, 8 Diamonds of the highest quality are inlaid alternately in a round or a diamond cut star. 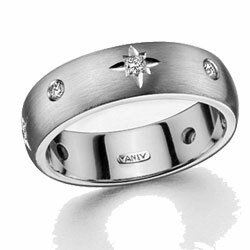 The diamonds are spread evenly all around the ring. The total of 0.19 carat diamonds are perfectly round cut, ensuring a brilliant and sparkling diamond of the highest quality. The ring is comfort fit and the outer surface presents delicate brushed finish.